In this treatise Shaykh Abdul Ghaffar Hassan deals with the topic of the compilation of hadeeth. 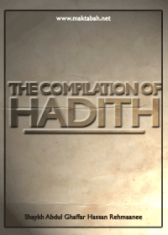 He explains various issues related to the preservation and compilation of hadeeth, including the method of preservation, the periods of compilation of hadeeth and the first books of hadeeth. The Shaykh goes onto explain the different sciences of hadeeth that were developed to preserve and explain the ahaadeeth and other books written on various subjects over the centuries.